Dan's interest in surfing began after reading an ad in Popular Mechanics on how to build your own surfboard. Having spent many summer days in the Jersey surf as a kid, he had a real love for the ocean. With a few friends, he sent away for materials and instructions. With increasing love and enthusiasm for the sport, he opened up his first store in Sea Isle, NJ. 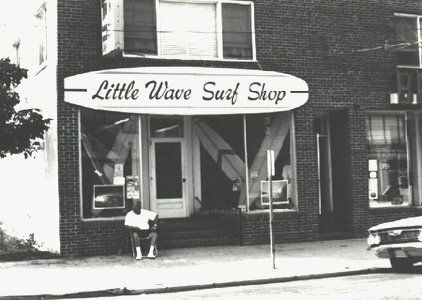 The store was named Little Wave Surf Shop Little Wave was one of G & S' first distributors on the east coast. Inventory at the store included lots of surfboards; from Harbor Ventura Plastic Poparts and Tanaka. Dan worked full time as a production supervisor in a chemical laboratory to support his wife and two children. He surfed every chance possible while not running the shop. Weekly contests became a challenge with shop sponsored teams competing vigorously against one another. He coordinated several competitions and never missed qualifying for the East Coast Championship in Hatteras along with his team. Dan Heritage began manufacturing boards on a full time basis. Because of limited experience in board manufacturing on the east coast, Dan had to teach all of his employees every aspect of the process. This included shaping, glassing, sanding, pinning and glossing. Everything Dan accomplished was self-taught. He worked endless hours with a persistence and determination to be the best he could. He was never afraid to try new ideas. Dan built his main retail location in Sea Isle City, NJ. It was then that his wife and children began getting involved with the business. Dan's Dad was an artist and photographer in the advertising field, he lent his expertise in the promotion of Little Wave's products. ``What better name to give your boards than your own?" he said. Dan's dad then designed the family crest logo for the first Heritage Surfboard decal. From there after Little Wave was known as Heritage Surf & Sport .